1. The performance of the alarm function depends on the performance of the alarm probe. The user should select the alarm probe according to the actual needs of the alarm. The controller is equipped with a pyrotechnic alarm probe at the factory. If the alarm function is not used, the probe is not defective. 2. Although the controller already has anti-static and lightning protection design, please ensure that the power supply and the chassis are well grounded to ensure that the circuit is not damaged by static electricity, lightning and other equipment leakage, and it will run stably for a long time. 3. The controller should be kept clean to prevent ingress of water or other harmful substances. It is strictly forbidden to use organic solvents for case cleaning. 4. Do not plug or unplug the terminals, or live the welding operation. When soldering the wiring, first unplug the corresponding terminal block. 5. When the direction of opening and closing is reversed, the “V” and “W” terminals of the controller can be adjusted. Similarly, when the STOP display indicates that the direction is opposite to the actual one, adjust the wiring in the same way. 6. The remote control is used by the code encryption when it leaves the factory, and cannot be interchanged.When the user needs to change,the password can be changed by the manufacturer as required. 7. The controller can directly plug the UPS uninterruptible power supply to ensure that the system can continue to work after the power failure. The system is equipped with a power-down protection device, even if the power-off system settings information and records are not lost. 8. Please be careful not to introduce other electrical signals into the controller when installing the remote control or other value-added devices. 9. The number of cable cores of electric gates should not be less than 8 wires (in the past, there were 7 wires, the wiring is not very reasonable), and the door cable should not contain connectors. 10. The delay automatic stop function can be set according to the stroke of the user’s door body. It is set to about 145 seconds at the factory. 11. Try to avoid connecting the controller power supply and other high-current working devices to the same power supply. The operating current of the relay is up to 7A. If controlling the larger current device, please install a more powerful relay. It is better to have a separately controlled switch from the main control power supply box. 12. When the controller fails, it should be repaired by a professional or contact the supplier and the manufacturer for repair. In order to avoid the failure to expand the impact of use. 13. Do not disassemble the components on the controller. This may cause loss of system information or chip damage. 14. Connected to the +12V terminal, it is beneficial to fully exert the performance of the card reader. If the card reader is powered by +24V, please separately equip it with a linear power supply and share it with the controller. Do not indirectly introduce +24V into the controller, otherwise it will cause burnout. 15. The remote control transmitter should keep the casing well to prevent extrusion, vibration, falling, water ingress and so on. Pay attention to check the battery voltage and replace it if necessary. When the remote control distance is too close, the battery should normally be replaced. The battery model is KC12V-23A. The remote control should try to avoid electromagnetic interference sources. 16. The type of the alarm probe output signal interface should be the relay output interface. The power supply voltage should be DC 12-15V. Otherwise, it cannot be directly powered by the controller. The probe should consume ≤100 mA. According to the site conditions, multiple probes can be used (usually 1-2 are suitable), and multiple probes are connected in parallel. The probe should be protected from other heat sources or direct light, and a rain cover should be added to the top. The above are the 16 precautions for the barrier gate controller! With more than ten years of focus on wireless remote control, the company has stable stability, sensitive use and beautiful appearance. It can be customized according to customer requirements, and it is also very convenient to use. 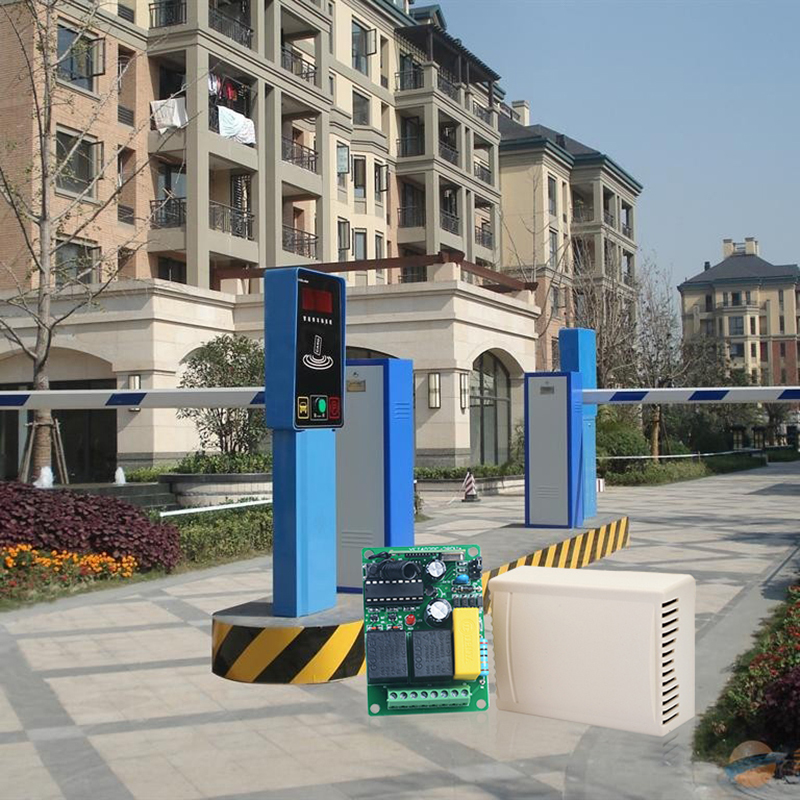 There are friends who need to customize the barrier gate controller, welcome everyone to come to consult!